Versa-Matic® provides maximum performance in a mini package with our Elima-Matic® Mini-Matic E8 3/8″ Mini Air Operated Diaphragm Pump. Small enough to fit in your hand, yet capable of pumping up to 8.2 gallons per minute, the Elima-Matic® Mini-Matic E8 Mini Air Operated Diaphragm Pump can be mounted upright, sideways, and even inverted to adapt to your application. Elima-Matic® Mini-Matic E8 3/8″ Mini Air Operated Diaphragm Pump also features our patented Elima-Matic® Air Valve System to deliver non-stalling, non-icing, lube-free operation as well as the elimination of blow-by. 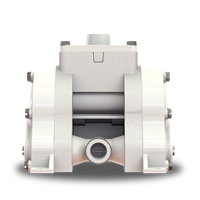 Elima-Matic® Mini-Matic E8 3/8″ Mini Air Operated Diaphragm Pump is available in Polypropylene and Kynar® wetted materials of construction, with XL (Santoprene®), Geolast® or Teflon® interiors. Click here for E8 detailed specifications.